Last weekend’s storm brought about 10 inches of snow to our end of Cape Cod, but other parts of New England had 2 to 3 feet! The public was instructed to stay off the roads during the storm. On Sunday, we went out in the early morning sunshine and took photographs. We headed down Sippewissett Rd. 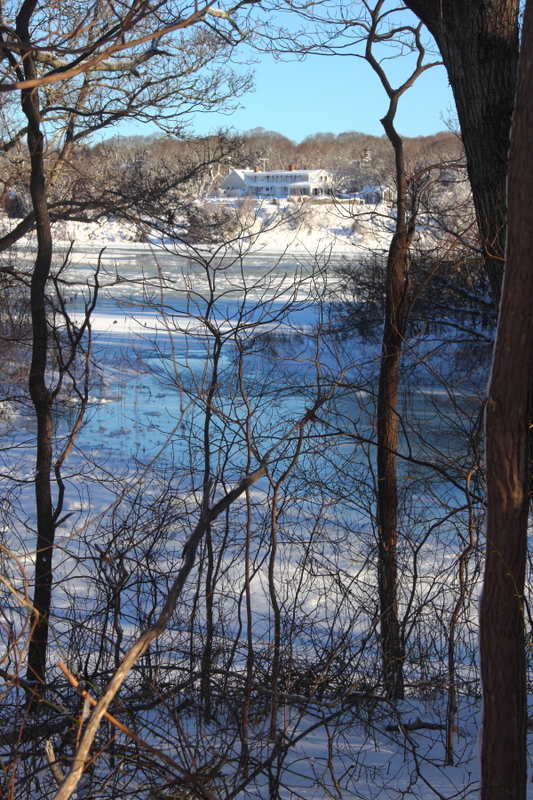 toward Woods Hole. The houses along the road had a story book look to them. 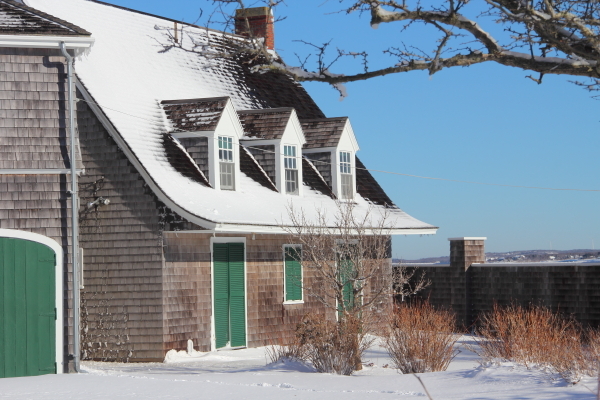 We then turned onto Quissett Harbor Rd., passing this house on our way to the water. 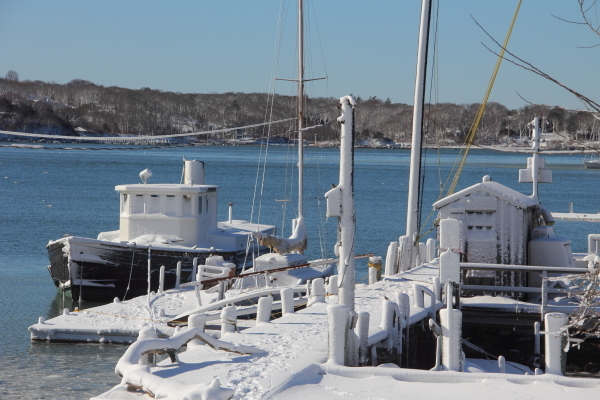 At Quissett harbor, everything was covered with snow. 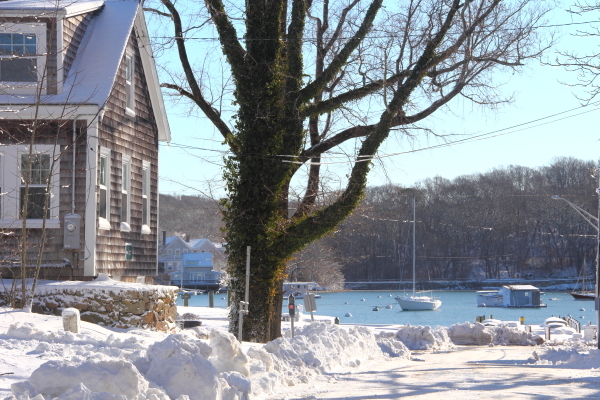 In the village, we stopped in front of the Woods Hole School, which I attended in the 60’s. It’s no longer a public elementary school, but houses head start and a day care in the winter and the Children’s School of Science in the summer. 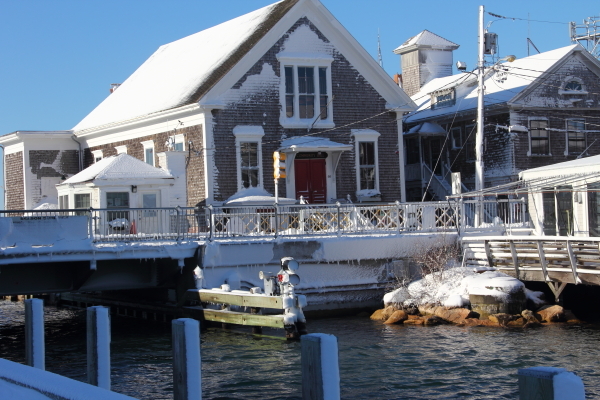 Further down Water St., I stood in the cold wind to get this shot of the draw bridge and Woods Hole Community Hall. 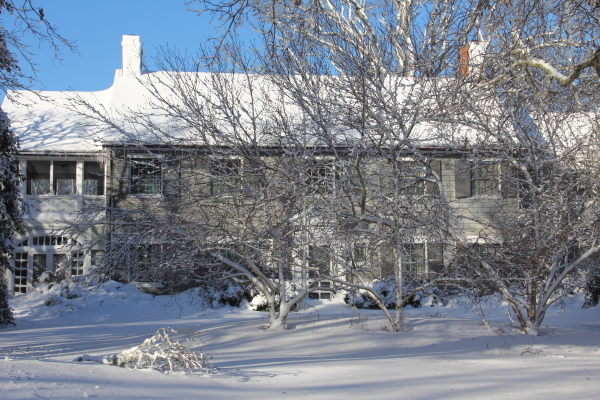 while other houses show evidence of people at play. 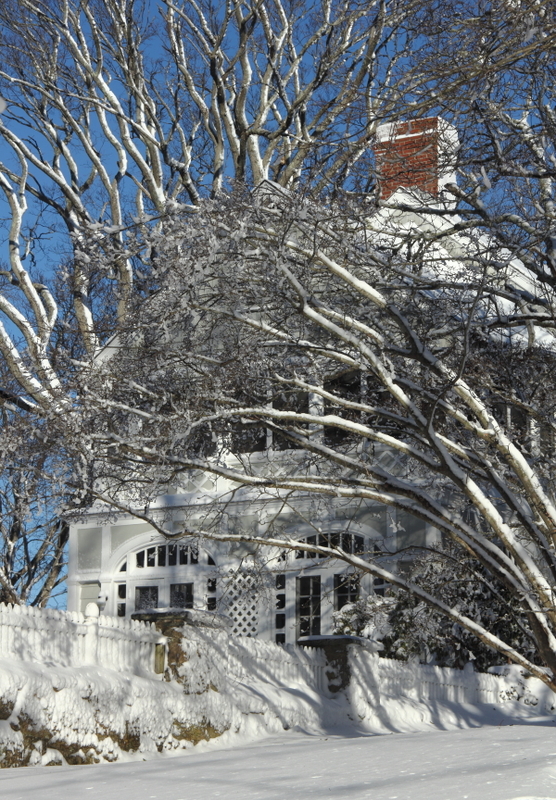 This entry was posted in Photography, Woods Hole by Salley Mavor. Bookmark the permalink. How beautiful! I love the snow, and here in Seattle we haven’t even had one flake. I am disappointed, to say the least. We got a foot here in Poughkeepsie but trust me our little town isn’t nearly as quaint as yours. 2 feet in Attleboro, but no where near as pretty. 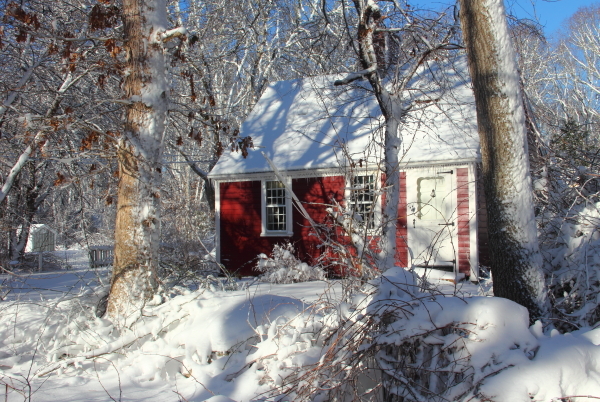 I love the red house with the snow. Will they show up in future work? I would take a foot of snow! I live in Kansas and it is terribly dry here. The pictures are beautiful. Awesome photos. We don’t see anything like that here in Longlea, Victoria Australia. 30degress here today. No rain since last October. Probably have to buy some water next week. Thank you so much for sharing these photos. I was thinking a lot about the folks in Boston and Cape Cod…hoping for all to be okay. I wonder if you lost power at all. During Sandy, we were out for six days, which was nothing compared to those closer to the coast, in NY and NJ. Indeed, that is when one knows what being “powerless” really means! I loved seeing the beauty of the snow in these pix, since it reminded me to focus on the positive even when thinking about losing electric power or the worry of trying to clean up. As I get older, I tend to forget just how lovely freshly fallen snow can be! 😉 Good thoughts to you, as we all look ahead to spring and summer. I wanted you to know how much I enjoy all the pictures you post. It gives me a “window” on the world. Thanks! OH Wow,beautiful images, another Aussie, from Queensland this time and we’re still cleaning up after the floods.I got some great images from the floods, for quilts and embroidery,will you be using your images in your work.Like you said the houses have a story book look about them and the snow adds a bit of magic to them. Seeing all your pictures of Woods Hole over the last good while makes me want to move there even though I’ve never been there! Such a charming place. > ** > Salley Mavor posted: ” Last weekend’s storm brought about 10 inches of > snow to our end of Cape Cod, but other parts of New England had 2 to 3 > feet! The public was instructed to stay off the roads during the storm. On > Sunday, we went out in the early morning sunshine and too” G’day > Salley, > Your book and poster arrived yesterday and I’m delighted with them. Thanks for the gorgeous bookmark which will always keep it’s place in the book while minding mine. The snow pictures are wonderful. 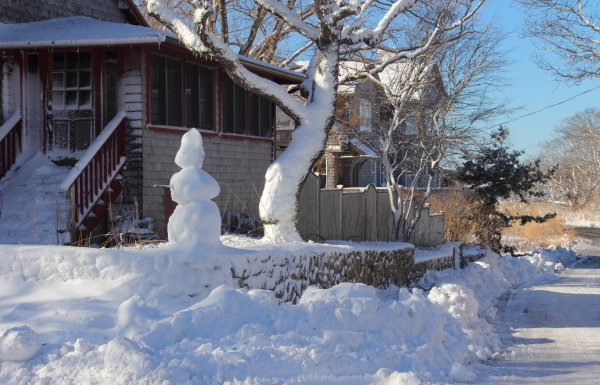 The snowman and the tree appear to be having quite a chat! Cheers, Kath Grabham Singleton, NSW, Australia. Beautiful photographs indeed – I loved the snowman’s pose beside the picturesque pose of the tree’s trunk. I am on Salt Spring Island, British Columbia, north of Seattle – no snow here, though we had a beautiful snowfall on Christmas Day! 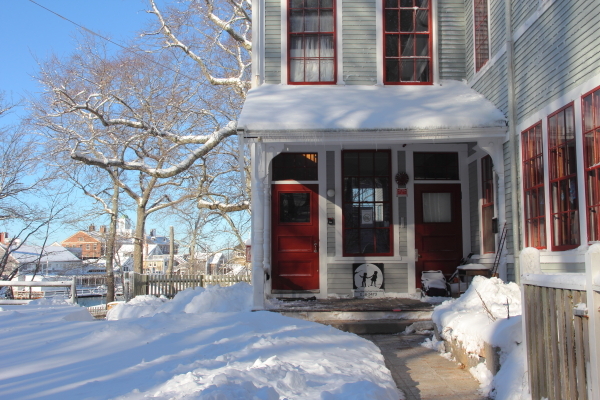 (A very rare treat – we do get snow, even had a dusting one year for Halloween trick or treating, and even had a New Year’s blizzard one year of an eternally memorable 143cm (that’s more than 56 inches deep!). I grew up in the southern hemisphere, with Christmas picnics on the beach, although the cards featured scenes of snow, and from New Zealand thought of snow as magical, unearthly, not factual. I first encountered snow in the northern hemisphere in the winter of 1962-1963 in south Devon, where snow never fell at all. That winter gave us a major storm, and the deep snow lasted for what seemed ages, drifting to fill the 6-feet deep Devon lane running alongside our farm property! The government helicopted hay bale drops. At 12 years of age I found the entire experience only amazing, wonder-full, exquisitely beautiful, utterly magical, and such a treat. At 64 now, and living in Canada, snow has become a normal part of winter life, and since I live in rural isolation, a time of connection to others – it gets me out and about like no other weather! As does a good week-long powercut (I have a wood burning stove, which makes a power cut heaven). I love the silence, I love the sunshine on snow, or the loght beneath deep heavy snow cloud, I love a horizontal blizzard – there is something about the air of snow that enlivens me and overcomes all physical aches and pains and disabilities. Above all, I love the beauty of snow ANYWHERE. When I lived in Vancouver it made the city so stunningly colourful – made for great photos. Snow makes a terrible mess when people plough it out of the way into filthy streaked hard heaps; we got around the farm in Devon by floundering about in to topmost foot or so, making no mess at all, and it all melted away into clean water when the thaw came; inconvenient to the adults, because that caused flooding. 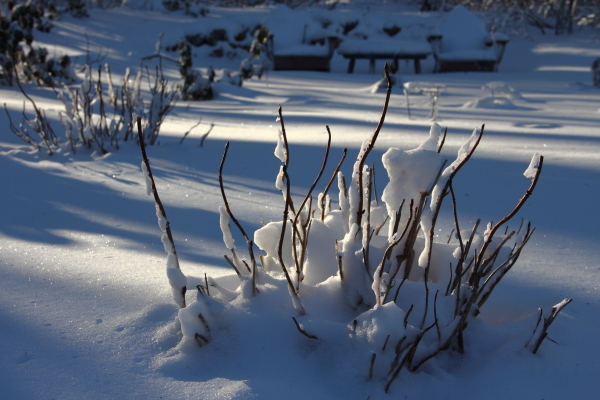 Nowadays for me the problem with snow and ice is the suffering of creatures unprepared for that because it is so far from the (previous) norm in the balmy climate where I live (the temperate rain forest of the Pacific North West). Thanks to you Salley, for getting out of the house at the perfect time for photographs! Thank you for the beautiful pictures of your town. Winter or summer, you live in a lovely place. Great photos Salley! Everything is so crisp and clear. We only managed a skiff over 3 days but it’s on top of all we got at Christmas here in UT. A lot depends on the Great Salt Lake effect. Sometimes we get dumped on and SLC gets the skiff but not this time. At least the air is clean and the sky was blue today. Temperature inversion is bad here unless there is a breeze. Brrrrrr! Lovely photos. Snow is great when it is new, but I hate it when icy or slushy. I live in Chester, England and don’t get the worst weather so love looking at others photos knowing I d not have to struggle through it! I first saw your work decorating at tree at the Concord Museum this past Christmas and was absolutely blown away with your talent.� Of course, I immediately purchased “A Pocketful of Posies” for myself, even though I am “a woman of a certain age.”� I pretended that I bought it for my grandchildren. Since I have signed up for posts from you, I have now become an admirer of your photography….you capture such beauty.� Salley, you are a woman of many talents and how delightful that you share those talents with the rest of us. During the summer I am in Wareham and would like to visit your studio on the Cape sometime this summer.� When would you suggest would be best? Pretty photos. 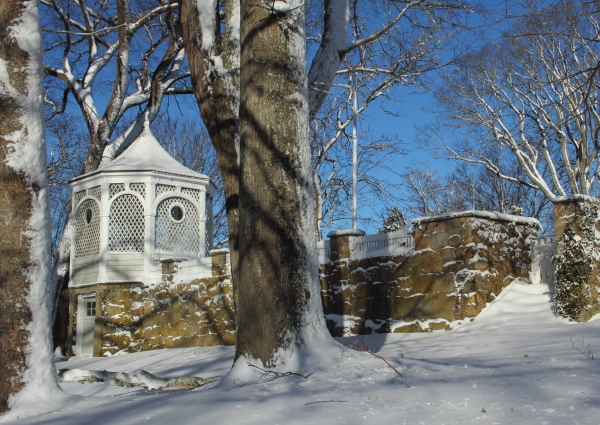 Just how I expect New England to look – as it always does when used as illustrations on Christmas cards. And I´m melting here in Brazil!